The new Motorola devices are coming closer to being announced, and today there has been more news about Moto Z3 Play, a premium mid-range model that promises good specifications. 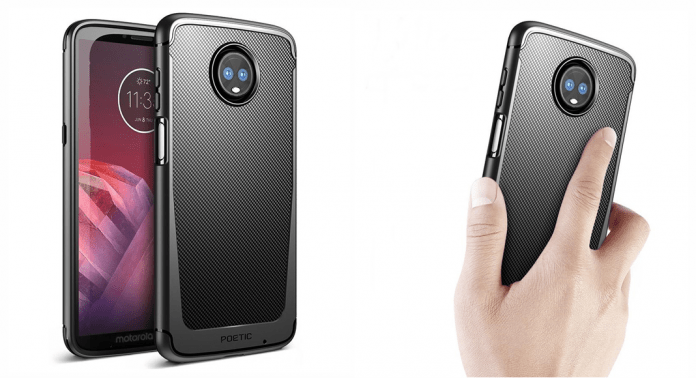 According to an image on the Poetic Cases website, the Moto Z3 Play appears with the Karbon Shield case. The images of the case reveal the front of the device that will come with a screen in the proportions 18: 9, and still shows us the back where the two main cameras are located. Also, something that draws a lot of attention is the big clipping around what appears to be the power button, which suggests that Motorola may have migrated the digital sensor to the side. On the other side, the device has another button, but we still do not know what its function would be. Previous leaks have reported that the Moto Z3 Play will come with a 6-inch screen, a 636-processor Snapdragon and versions with 4 GB of RAM + 32 GB of storage and 6 GB of RAM + 128 GB of storage. The battery may still contain something around 3.000mAh and last but not least, the rear cameras may have 12MP + 8MP and 5MP sensors for the selfies. We know that Motorola has an event scheduled for tomorrow (19) here in Brazil and in this way, we will know more details about the Moto Z3 Play.